Throughout summer 2017 and early autumn, cycling is a big Bike Garden theme. Every Wednesday, to the end of October, from 7am to 7pm, a qualified Bike4Health mechanic will be at the garden to do free bike checks and give advice about all things cycling. This is part of a collaboration with Greening Wingrove CIC to make cycling more affordable, more accessible and more attractive for local residents. We hope to open a park cafe to accompany these open sessions. Cycling events and workshops will be on offer on Sundays, with free guided bike rides and children’s bike schools for different ages. Check our events page for details about future activities. On Wednesdays 2-4pm, until the end of August, the Wildlings Kids’ Club will offer free outdoor learning and fun sessions for children of all ages. The project is organised by our partner, the Time Exchange and funded by the Greggs Foundation. The Arthur’s Hill CHAT Trust is holding its regular drop-ins for local young people on Friday evenings from 5.30pm, until the end of September. Several initiatives to make our park an attractive place for everyone happen at the Bike Garden. On Mondays (except bank holidays) at 10am, local residents Jill and Alison lead a park litter pick (usually much-needed after a busy weekend). All are welcome. Many hands make light work. A great way to get to know neighbours. Thursdays, 10am to noon, Time Exchange gardeners lead volunteer sessions, where local people help and learn how to grow vegetables, fruit, herbs, and pollinator-friendly plants, look after and improve our garden. The last Sunday of each month sees the Friends of Nuns Moor Park (made up of local residents) meet at the Bike Garden to work on a part of the park they think needs improvement. Tasks vary from month to month. A community choir for women, anyone who identifies as a woman or identifies as gender fluid/gender queer. All ages welcome (including little uns) and no previous singing/choir experience required. Discussions are currently underway with Platforma representatives about bring part of its October Festival to Nuns Moor Park. Watch this space. Wassailing is an ancient ritual bringing the community together to sing to the health of the trees and scare away the naughty spirits to welcome in the spring so the trees bear fruit in the coming seasons. We have craft and singing workshops to make paper lanterns and a wassail crown all in preparation for the crowning of the Wassail King or Queen and a lantern lit, singing procession to visit the Community Orchard in Nuns Moor Park. This event creates a buzz in the garden to celebrate the valuable ecosystem services provided by the bees, birds, butterflies, bats and beetles. Without them we wouldn’t have apples, strawberries, melons, almonds and even chocolate! Come join in craft activities, hula hooping, face-painting and learn about honey bees from the bee keepers association’s virtual hive! Free pollinator friendly flowers are also given away to promote more pollination throughout our streets. This event is to celebrate the work of Greening Wingrove CIC board and members who generously give their time to make our area cleaner and greener by taking part in litter picks, street planting or Friends of Nuns Moor Park activities. Fun activities in 2016 included a bubbleologist, face painting, Mad Hatters magic potions and mud pie making, raffle and food stalls from Samosa Sisters and Edible Cycles, not to mention lounging on the lawn with picnics and tasteful tunes being played in the afternoon sun. Inviting the local community to celebrate our very own heritage Community Orchard planted in Nuns Moor Park and welcoming into the Autumn season. 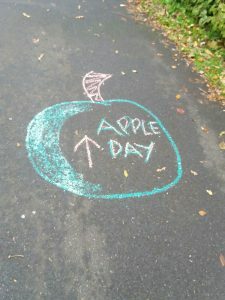 There are a variety of family-friendly activities and games all around the theme of apples that all take place in the park and Bike Garden. Kilos of apples get turned into fresh apple juice using a machine to cut them up and an apple presser to squeeze them into tasty apple juice to be sampled in the delight of harvest! Autumnal preparations also include making bug hotels for the garden’s beasties to over-winter to maintain natural balances for the seasons to come.